Faulkner Open House and Annual Potluck, save the dates! We have two important dates in the next week or so. 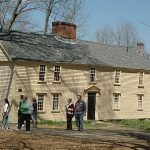 The first is a demo/open house at The Faulkner House in Acton. I plan to be there from 3-5pm on Sunday, 24June. Can anyone join me? I know, this slipped thru the cracks, and is last minute. If anyone can be there, please email me at laura@northbrookalpacas.com. It’s at 5 High St, Acton Ma. Note, they are having a “Frolic in Fairyland” kids event from 1-3, before the open house. I will bring a spinning wheel, but also be prepared to weave on the Faulkner House Loom. Please join me if you can. Sorry we didn’t get this announcement out sooner! We also have Faulkner Open Houses on 22July, 23 Sept, and 14 Oct. Please also let us know if you can do any of those. We will be putting out reminders (hopefully with more notice than this Sunday!). The second, very important date is for our annual potluck meeting, 26June, at Reba’s, starting at 6:30pm. Specific details will follow via direct email. Plan to bring a dish to share, a place setting (plate, silverware, cup, napkin), your guild challenge, and your wallet….Reba will be having a yarn sale, with 25% going to the guild. Cash, checks and credit cards welcome. Also bring any other show and tell you might have. I think we’ll have a lot of fun seeing what everyone’s done this year. And seeing what everyone did differently for the challenge! This will be a great finish to our guild year, and an opportunity to do some outreach at Faulkner over the summer! Hope to see some of you Sunday, and most of you next Tues!!! Stone Cow Brewery Fiber Festival, Sunday, 10June! New fiber festival at Carter & Stevens Farm in Barre, MA. Fiber vendors, demos, food, beer, music and animals! You will likely see some familiar faces. More details below. Faulkner House Loom Ready to Weave! 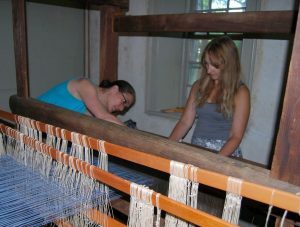 We finished warping the Faulkner House Loom today, just in time for the Hidden Treasures open house this coming Sunday. Hours are 3-5. Dimensional Double Cloth Presented by Anastasia Azure! This presentation will highlight the sculptural possibilities of the double-cloth technique. Anastasia Azure weaves extensively with the double-cloth technique, transforming metals and plastics into dimensional weave forms and jewelry. Short videos will reveal her tips and tricks to working with fine wire and slippery fishing line on a loom. Weavers will leave inspired to create unusual shapes with unconventional materials. Our next meeting will be held at The Fiber Loft on 24April. Come by for social and library time at 7pm. The meeting will start promptly at 7:30. Chriztine Foltz – “Fibers are the building blocks for my creating. These fibers form my textiles, my thoughts, my community, and my home; intertwining and interlacing everything into that which I am”. Chriztine Foltz is an interdisciplinary artist who initially started as a textile designer. Textiles created the foundation upon which she built her artistic practice which commenced in Denmark at the Danish Design School (now part of the Royal Academy of Fine Arts, Architecture School), where she studied techniques for woven and surface designed fabrics. Upon return to the United States, she settled in NYC, designing woven fabrics for interiors and wearable accessories such as raincoats, umbrellas, hats, handbags and scarves as an independent contractor.Working on the “SWATCH” Accessory Design Team in the mid 1980s, her designs were being stolen/reworked in the orient and reproduced before the samples were returned to her in NYC. This lack of control sent Chriztine back to school to learn computer graphics and she worked in the graphic arts arena for the next 15 years, before returning to her roots in textiles and weaving. Weaving again, teaching at the Worcester Center for Crafts and at local colleges, Chriztine found her ‘over/under’ rhythms again. Discovering that engineering companies needed designers of fabrics and clothes, she started working on projects for military and medical use. This collision of artistic, industrial, and scientific worlds has encouraged her to work on diverse projects as well as work with teams of engineers and scientists to create innovative new forms of textiles including the spinning of CNTs (carbon nano tubes) into yarn, weaving fabrics for the International Space Station, and creating fabrics for medical devices. The interlacing of these worlds, art and design, ignites and re-ignites her desire to create solutions aimed at enhancing our quality of life. Chriztine has a Masters of Fine Arts in Interdisciplinary Art from Goddard College. The tapestries she created for her Master’s were jacquard woven in black and white and then hand painted, merging her original studies of woven and surface design, closing the circle of her education. Someone has donated a complete set of Threads magazine to our library. It’s going to be a while before they’re completely processed and catalogued, but contact the librarian if you want to borrow specific issues. According to the online index, there are twelve articles by Daryl Lancaster, including “Sewing with Handwoven Fabrics” in issue #163. We’d like for many Guild members to become involved with this over the coming months. If you’re interested, please email Penny. One of our generous previous WHC attendees has offered to sponsor a qualified person for the conference on May 17-18. Interested applicants should contact me at Marina@TIArtsCenter.org for details. Bow loom weaving is an ancient weaving technique. 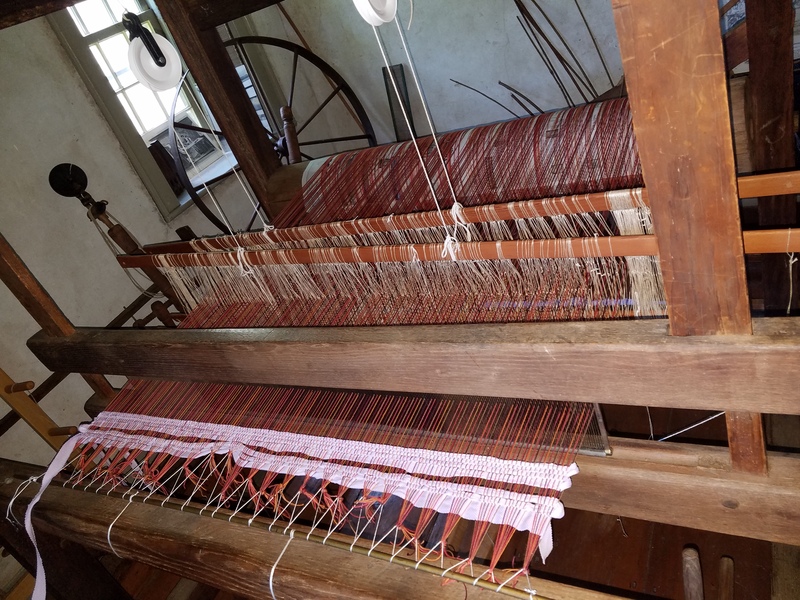 Traditionally, the loom would have been a flexible tree branch with warp thread attached to both ends, flexing the bow to create tension on warp threads. Threads were separated by a piece of hide or a piece of wood. Today, items from hardware/craft store and household items can produce a bow loom. At our meeting on Tuesday 27 March, NVWG member Carol Vales will lead us through warping a bow loom and weaving a narrow band. Items created on bow loom are usually 4” or less in width. These include: headbands, hatbands, trim for clothing or bags, and lanyards. Materials will be provided, but if you have a strong warp yarn you’d like to use, 5/2 or 3/2 cotton is recommended. Generally the same yarn is used in the warp and weft. Beads may be added for decoration. Participants will be able to take their looms home with them. Participants should bring scissors, a tapestry needle for weaving and a sharp needle for weaving in the ends. Optional: 3/2 or 5/2 cotton and size 6 beads in your color choice. This program is made possible through the Guild’s Pauline Duke Education Fund. Social time, snacks and library browsing start at 7 p.m. The meeting starts at 7:30. Link to Jacquard Loom site with video!